If the gains are due to the birth and immigrations of individuals are equal to the losses due to death and emigrations then the symbol representing these gains and losses can be used in following equation. Then the population will decrease in size and may cease to exist. The rate at which mature adults are replaced in a stable population which is in equilibrium will depend on life span of organisms. One way to start population study is to work out the age structure of the whole population at one point in time. To do this the size of the population (number of individuals) and the ages of the individuals need to be discovered. It is easy to estimate number of trees which are large and stationary. The ages of a few plants can have determined, for example the age of trees in temperate regions can be easily determined by counting the annual growth rings. However, tropical trees do not show distinct growth rings. The leaf bases may also be useful for dating plants such as palms if they have a regular yearly leaf production as the scars left by the leaves can be counted. But in most cases, it is usually impossible to determine the exact age of organisms, even to the nearest year. This is because most organisms do not have a structure which records yearly cycles or because study of such structures can only be done by killing the organisms or harming the organisms. However, cohort studies are not suitable for very long-lived- species as they would take too long to complete. For long-lived species a mixture of age structure and cohort studies is best. The numerical data collected during a population study can be presented as a table of figures known as a life table. Life tables usually represent data for a cohort (cohort life tables) but can also be produced using age structure data. 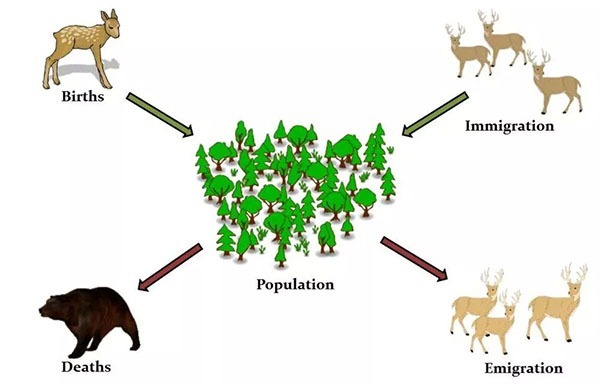 Life tables usually include the numbers of organisms surviving or dying in a given time for various age classes and the corresponding survival and death rates. Cohort life table data are often shows as survivorship curve for a particular population. This is a graph showing the number of individuals which survive per thousands of populations through each phase of life. Mortality and survivorship are not easily condensed into life tables. To begin with, age difficult to determine. Mortality of individuals usually stimulates the growth of survivors, increasing the living tissue or biomass and the size of the modular populations of buds, leaves and stems. Seedlings make up a larger numerical proportion of individuals but an extremely small portion of the biomass. Further, it is difficult to separate and even identify individuals. The demographers have to deal with mortality and natality at two levels, the individuals and clones. In plant demography the life table is most useful in studying three areas: seedling, mortality and survival, population dynamics of perennial plants marked as seedling, and life cycles of annual plants. The time of seed formation is the initial point in life cycle. The Ix column indicates the number of plants alive at the beginning of each stage and the dx column the number dying. The Lx column gives the mean number of plants alive during the life cycle. The Tx column gives the total number of plants remaining at the beginning of each life cycle stage. Foresters have developed another approach to the life table of plants. They take into account age class and density of trees in each age class, with additional column giving diameters and basal area. Another way of representing the demographic data is as population pyramids. These ore often used in human demography. The pyramid is just two bar graphs back to back, with males to the left and females to the right of a central line. For humans, where population pyramid usually represent number for a whole country, the shape of pyramid reflects birth and death rates. Bottom heavy pyramids show increasing annual birth rates or high birth rates and high infant mortality. Top-heavy pyramids with more old people than expected show a decreasing birth rate and good adult survival.